Pantone Universe - Color is life! Live it! Did you know there is a color dedicated to your birthday? 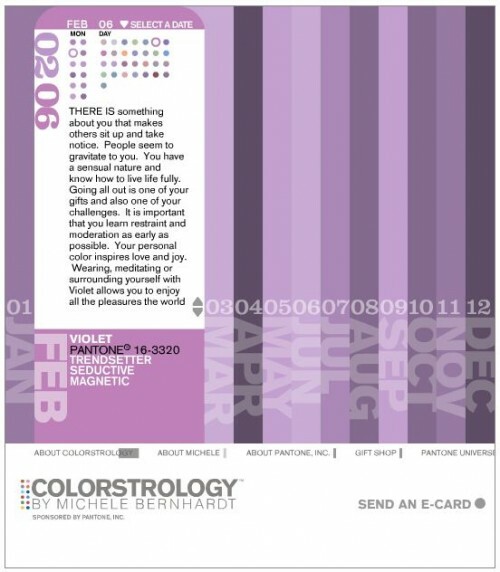 Trendsetter, seductive and magnetic are the traits of violet, today’s birthday color (February 6). Check out Pantone’s Colorology to discover your color and special insights to your personality. While you’re at it check out the Pantone Universe, a design-led collection for the home, the workplace and the road… Accessories and apparel you need in designs you want – and in colors you love, by Pantone, the author of the universal color language. Pantone's Colorstrology- What's your Birthday Color? Hi Mippy! Yes, it is amazing how right on it is! Sorry about the giveaway button… it isn’t active right now but will be starting up again soon so please check back…. and it will be posted too! Thanks so much for stopping by. Love the color Purple. It said that purple brings out your creativity and that is is the color of god. BTW Love your pillows. Thank you so much for your comments. I guess we need some purple pillows on here! 🙂 Purple, paired with gray is huge right now. Thanks for stopping by Heidi! Interesting. I’ll go check it out! Thanks for sharing.